Many riders who wants to get a new bikecomputer with inbuild GPS, so they can track their own route and plan new routes before their rides, will be looking at a Garmin Edge. They come in three different series. The 200 series, the 500 series, and the 800 series. The 800 series is the Rolls Royce of the bike GPS’s out there, coming in at the price of around 400 euro’s, including speed/cadencesensor, heartbeatsensor and a map of the area you live in (continent, etc.). 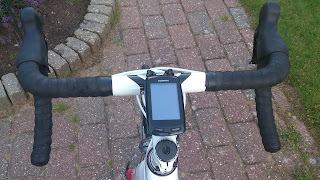 The Garmin Edge 800 is probably the best you can get, and many buys the 800 when they are switching their standard bikecomputer out with a GPS-based bikecomputer. The installation is easy. The holder for the Edge 800 unit is installed within a minute, just needs 2 rubberbands (not the normal ones, but some much stronger). It’s really functional. If you want to take the Edge 800 off it, you just turn it 90 degrees to the side, and it can be released. Same thing then you want to put it back on. The speed/cadencesensor just need two strips before it’s on place. Remember to use a bit of tape so the strips will not damage the paint of your bike, when tightened and in use. Of course remember to make sure it’s tight. Once that is done, it will sit perfectly. 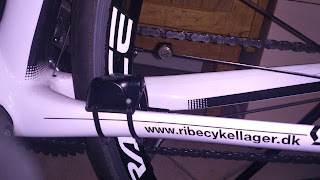 Also there will follow a bit of tape that will be used for the magnet to sit on the crank to measure your cadence. 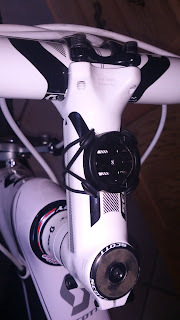 There will also be a magnet to measure the speed, if the GPS will fail, like under a bridge, can sit on a single spoke on the wheel, like a normal magnet for any other bikecomputer. It works just as expected. You start it up, wait for the GPS-signal, and then it is ready to go. That can take everything from 15 seconds to 3-4 minutes on a bad day. I guess it depends on where you live, as well as the placements of the satellites. You can always just turn it on, put your bike outside, and then get your helmet and such things on, and it will probably be ready to go then you are. However, once it has a signal, it really holds that signal until the end. I have been riding under small bridges (100-200 meters), and it would still keep the signal. I can also get a signal with it, if I take it into my house, after training. The weight of it is about the same as a normal smartphone. Many people will probably be asking about the battery of the Edge 800. But it won’t be a problem in your everyday training or normal races. I have used it for a race that lasted about 8-9 hours, and there was still 43% capacity left on the battery. Therefore, unless you are doing the Race Across America, or some 24 hour race, it will be just fine. It tracks the speed just fine. There is the standard lag in acceleration as any other bikecomputer, but the GPS along with the speedsensor on the spokes, will calibrate to make your distance and speed more realistic than a normal speedsensor (probably only like 30 meters over 100 km difference). The size of it is acceptable. It can fit on the stem, but do not go on buying very short stems, because that can maybe give you an issue. There are alternatives of course, so you can place it on other parts than the stem. 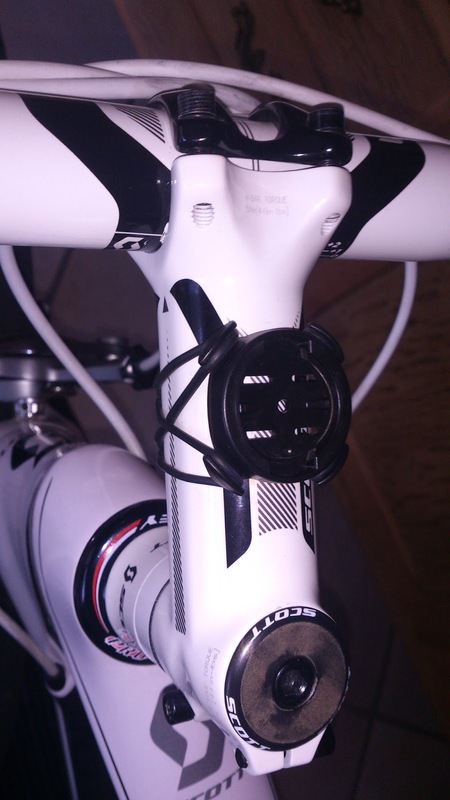 The cadencesensor, which is the same unit as the speedsensor, works just fine. I cant seem to make it give a weird result. It just always shows values that are believeable. And the connection from the sensor to the Edge 800 isn’t a problem neither. The heartbeatsensor seemed nice in the start too. It was more comfortable than I expected, and just as importantly, it was really useful for optimizing your training. It will also help you get to know your body better for races, so you know how much you can push throughout a race. With it, you can also train after your pulse, and the different pulsezones there is, which will make your training much more effective. For me, it needed to be soaked a little with ordinary water, before it worked. Else, it would start working about 8-10 minutes into my training, due to sweat. After 2 months though, it began giving me problems. It suddenly told me I had a pulse of 40 when having something that would be more like 170 bpm. I tried switching batteries in the sensor, but did not help anything. I have searched a little, and it does seem that I’m not the only one having this problem. Many has bought a Polar pulsebelt and then used the Garmin sensor along with it, and for them, that combination works just fine. I have not had the money to do that, so I have been riding without that the past 11 months now. The software of the Edge 800 works great. It is simple but still gives a lot of information. You can make many different pages on it, which you can switch between. You can also make the pages just as you want it them be. Everything from map, altitude, map, and a page where you can get up to 8 different information’s shown on the same time. So you will always be sure to have the information’s you want to have, at the same time. After your trip, you can upload the file your Edge created from your training to different sites, where you can see how the race/training went. You can read about some of the different sites tested by me, if you click here. Is it worth the price? Well, that depends on what you want your bikecomputer to do. If you want to add and see routes, and be able to get more out of your training, I will certainly say that this is a great buy then. But if you just need to see your speed and distance, then go for a standard 30 euro bikecomputer. If you do not have 400 euro’s or wants to put 400 euro’s after a bikecomputer, the Edge 200 and 500 will be cheaper but also good solutions for that then. The 200 does not have a map inserted in it, so if you want to see routes while on your bike, the 500 is the cheapest you can get. There are other alternatives than Garmin too though, like Bryton. But as a package, you get a much funnier training with the Garmin Edge 800. At least if you are an analytic freak, it will be very fun to see how you perform in different aspects. The heartbeatsensor did not work for me, but for 9 out of 10, it does, and for those, it can help optimizing the training quite a bit. One thing I am sure of, is, that I never regretted buying it. I absolutely love it, and all the functions it comes with. So if you want the best, and/or wants to get more out of your training, the Garmin Edge 800 is a sure thing on the “to buy”-list.